This weekend it was our youngest and oldest teams in action. 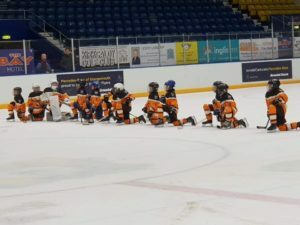 1st up were our youngsters, our Under 10’s & Learn to play (LTP) members who travelled through to Fife Ice Arena to play against an undefeated Kirkcaldy Team. 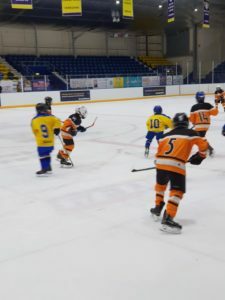 Our Sabres (U10’s) ended Fife Eagles unbeaten start to the season with a fabulous 7-1 win. Man of the Match for North Ayr was #11 Lucas Allan. Big thank you to Fife for the invite and the loan of some players into both our teams. We look forward to welcoming you to Auchenharvie in the near future. Next up was our SNL Team; North Ayrshire Wild v Paisley Pirates at Auchenharvie Ice Rink. This weekends game is the 3rd time both teams have faced one another with a stalemate after two games , so who will be the winner of this one. In the first period it was end to end play with a good display of hockey and the period ended 0-0. The second period started and things were hotting up, both teams were evenly matched with their shots on goals but it was to be the Pirates who turned the puck first, breaking forward in a penalty kill situation to get the 1st goal late in the second period. The 3rd period was much the same with Wild upping there play but this was too late as Pirates got their second goal on a power play situation. On the night, Pirates were more disciplined with Wild taking 78 mins of penalty mins against only 12 mins against the Pirates. The Wild need to sort their discipline on the bench and on the ice. The game ended North Ayrshire Wild 0-2 Paisley Pirates. With 21 shots on Pirates goal against 34 on the Wild Net Minder – on paper, there was only going to be one winner. Man of the Match: Scott Beveridge (Net Minder). 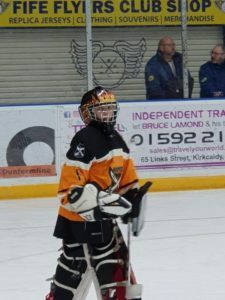 North Ayrshire Stars v Kilmarnock Lightning (U14’s) – Face Off 6pm at Auchenharvie Ice Rink, Stevenston. North Ayrshire Sabres/Learn To Play are at Dundee Ice Arena for X-ice games. North Ayrshire Wild v Kilmarnock Thunder – Face off 5pm at The Galleon Centre, Kilmarnock.